Here's a cool sports tin sign that also looks like an art tin sign for college! 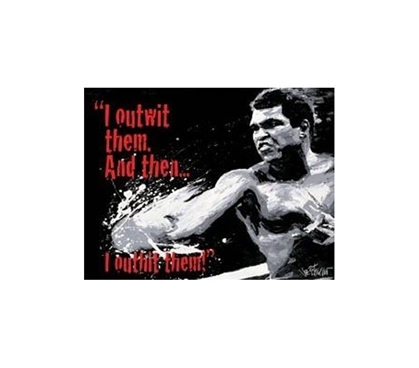 If you're a fan of boxing or of Ali in general, then this college tin sign is perfect for your dorm. When choosing your dorm room decor, you'll want items for college that reflect your interests and passions. Or, if that still doesn't apply to this college tin sign, it at the very least has a cool and artistic image to enhance your college decor. When you're decorating your dorm, you'll need fun wall decor items to ensure that your dorm room looks and feels its best. So do that with unique dorm items, which means that college tin signs are the perfect dorm supplies for that objective.